Automattic is a renowned web development company best known for shaping the modern web era. The company is acclaimed for the creation of superior web solutions which include WooCommerce, WordPress.com, Jetpack, Akismet, Longreads, Simplenote, VaultPress, Pooldaddy, Gravatar, Cloudup, etc. These platforms leverage the open source nature which means they can easily be customized and shaped to the user liking. The company has rolled the sleeves to achieve its goal of democratizing publishing to give everyone a platform they can tell their story regardless of the gender, income, politics, locale, and language. In addition, the company provides cloud hosting solutions which are targeted at the high-end users and websites. The hosting solutions are slightly expensive, hence ideal for the corporate website and large platforms. 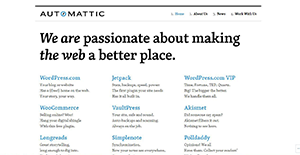 Automattic is renowned for developing a broad spectrum of platforms and projects. The company is recognized as the ultimately distributed organization that has revolutionized the web. The development of the groundbreaking platform is a technique built to its bones and tied by core benefit uptime and reliability. Most of its platform are open source in nature which gives developers the freedom to customize them to look exactly the way they want. Also, its platforms are epitomized by excellent security, DDoS protection, and spam protection. It reliable hosting platforms allows you to utilize the established WordPress.com grid which boasts more than 3000 servers strategically located in multiple data centers. This guarantees reliability and ensures your website never drops unexpectedly. Besides, the platform provides access to a high-quality tech support, Team of experienced WordPress experts, SEO, Unlimited bandwidth and disk space, and more. One of its best-known platforms is WordPress.com which is a reliable blogging platform. WordPress.com is owned and hosted by Automattic and runs on an efficient open source platform called the WordPress. The platform provides a reliable free blog hosting for all registered users and only generate revenue via paid upgrades. Another noteworthy platform is Akismet. This is a robust spam filtering solution designed to eliminate spams from trackbacks, contact form messages, and comments. This solution is supplied as a plugin and is activated in WordPress.com hosted blogs. Companies have unique wants and requirements and no software application can be just right in such a scenario. It is useless to try to find an ideal off-the-shelf software app that fulfills all your business needs. The intelligent thing to do would be to customize the system for your unique wants, worker skill levels, finances, and other elements. For these reasons, do not hasten and pay for well-publicized leading applications. Though these may be widely used, they may not be the ideal fit for your specific needs. Do your homework, investigate each short-listed platform in detail, read a few Automattic reviews, speak to the vendor for explanations, and finally select the application that offers what you require. How Much Does Automattic Cost? Automattic’s SMB and enterprise pricing information is available only upon request. Contact the company for more details, and ask for your quote. We realize that when you make a decision to buy IT Development Software it’s important not only to see how experts evaluate it in their reviews, but also to find out if the real people and companies that buy it are actually satisfied with the product. That’s why we’ve created our behavior-based Customer Satisfaction Algorithm™ that gathers customer reviews, comments and Automattic reviews across a wide range of social media sites. The data is then presented in an easy to digest form showing how many people had positive and negative experience with Automattic. With that information at hand you should be equipped to make an informed buying decision that you won’t regret. What are Automattic pricing details? What integrations are available for Automattic? If you need more information about Automattic or you simply have a question let us know what you need and we’ll forward your request directly to the vendor.